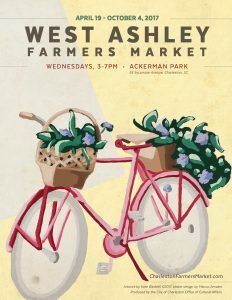 The West Ashley Farmers Market (WAFM) is produced by the City of Charleston Office of Cultural Affairs (OCA) in cooperation with the City of Charleston Parks Department with guidance from the Special Events Committee. 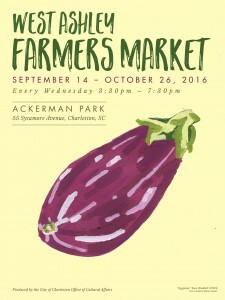 The OCA has a long history of producing the highly successful downtown Charleston Farmers Market (CFM), which is held in Marion Square each Saturday. The WAFM is dedicated to the support and advocacy of local farmers and growers and features fresh seasonal produce, as well as sweet and savory foods from area vendors who source ingredients from nearby farms. The WAFM will build upon the success of the CFM by expanding access to local fresh food, supporting the local economy and local agriculture, providing a civic gathering place and opportunities for community engagement. A curated program of live entertainment and family-friendly activities will enhance the farmers’ market experience. Addressing one of the key strategies in the City of Charleston’s 2014 West Ashley Strategic Plan, the WAFM will help create community partnerships and reactivate civic spaces. Ackerman Park is a popular and easily accessible City-owned park that is also adjacent to an underutilized commercial strip center on St. Andrews Boulevard. The WAFM has the potential to be a catalyst in the revitalization of the area – similar to how the downtown CFM was instrumental in the revitalization of Marion Square. To purchase poster online, click here.